When hiring an electrician to service your Wayland, Massachusetts, home, it’s important to make sure that the contractor you select is experienced in the area of service your home requires and also understands the latest industry best practices. At VMA Electric, we employ skilled technicians who generally have at least a decade of experience, and we also strongly encourage our staff to receive continued training related to the latest technologies and installation techniques. And when you call for service, we’ll always schedule an electrician who has expertise in the specific area your job requires. 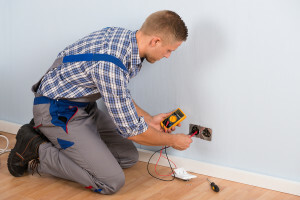 Whether it’s a small repair job or a whole-house rewiring project, VMA Electric has the knowledge and expertise needed to make sure the work is completed to your satisfaction. We’ve been the residential electrician of choice for the Wayland, MA, area since 2008, and our owner, Victor Archila, is personally involved in every job we do. Generator installation – We can help you select the generator that best fits your home, from portable models that can power a single appliance to permanent whole-house units. Wiring – We can do it all, from phone, data, and cable wiring to whole-house rewiring. Lighting installation – An electrician from VMA Electric can install your indoor or outdoor lighting systems. Miscellaneous installation – We can set up your home security system, fire alarm, smoke detectors, or home automation system. Additionally, a licensed electrician from VMA Electric can also provide a wide range of general electric services, including minor repairs, maintenance, and troubleshooting. To speak with a customer service representative or schedule a service call for your Wayland, MA, home, contact VMA Electric today.